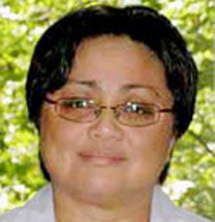 Norma Timbang is known for her skill in building effective working relationships with community activists and legislators. She has been instrumental in community campaigns that focus on human rights and immigrant issues. She also has extensive experience organizing around issues affecting Asian American women, especially domestic violence and human trafficking. In 2012 and again in 2014, she visited Cuba as a delegate to the US Women and Cuba Collaboration. As part of this outreach, Timbang lent her passion and expertise to strengthen citizen-to-citizen diplomatic relations in an effort to further social and economic justice. In 2014, the School of Social Work honored her broad and effective community work with the Martin Luther King, Jr. Community Volunteer Recognition Award. Timbang has worked with many organizations on the local, national and international level, including the National Queer Asian and Pacific Islander Alliance, International Community Health Services, New Beginnings and Asian American Pacific Community Health Organization.